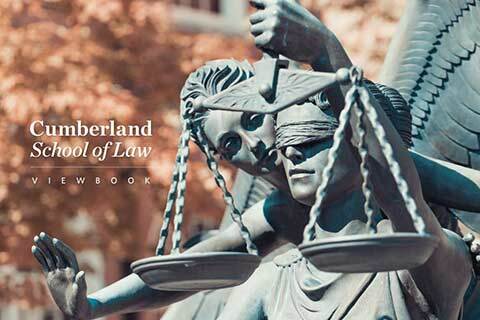 Cumberland School of Law provides students with opportunities to connect with faculty, internships and current lawyers, as well as a high-quality education. First, the collegial, scholarly interaction between its faculty and students. Second, Lawyering and Legal Reasoning. Known on and off campus simply as LLR, this comprehensive, cutting-edge writing course gives each first-year student hands-on experience in skills necessary to be practice-ready on their first day. Third, our location. Cumberland School of Law is situated on Samford University’s campus near downtown Birmingham, one of the legal hubs of the Southeast. Our proximity to this dynamic market offers our students an environment rich with opportunities for externships and extracurricular activities that enhance the classroom experience. The mission of Cumberland School of Law is to educate a diverse community of students with knowledge and practical skills, equipping them to become highly competent, ethical lawyers committed to professionalism and public service.